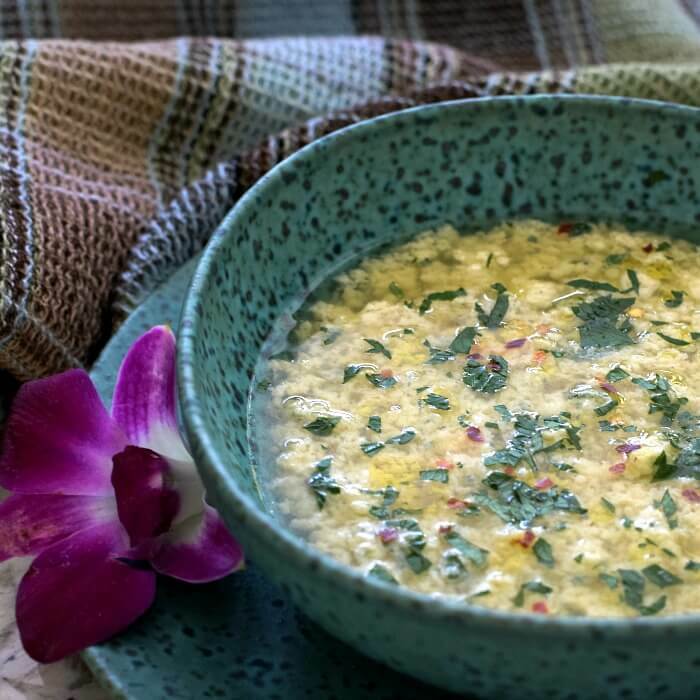 Stracciatella alla Romana is a light brothy soup that is sometimes referred to as Italian egg drop soup. It’s easy to make with ingredients you usually have on hand — eggs, chicken stock, Parmesan cheese, and semolina. Stracciatella is also known as rag soup because straccetti means little rags and the egg mixture gives the appearance of little torn or shredded rags. It’s the type of soup that will satisfy you and your family every single time. For this recipe, you will need: chicken stock, eggs, Parmesan cheese, pecorino cheese, nutmeg, semolina flour, fresh parsley, cayenne pepper, nutmeg, red pepper flakes, extra-virgin olive oil. Stracciatella alla Romana is a peasant dish. You can find the ingredients in the poorest of homes. It’s a simple dish. Tired and hungry you can make the rag soup in less than 10 minutes. It’s a fortifying soup. One that satisfies and warms you from the inside out. You’ll find many stracciatella recipes throughout the different regions in Italy but what’s basic is the broth, eggs, and cheese. Many cultures have a version of egg drop soup. They use the soup to fortify tired bodies and souls and even as a natural cure-all. The Farmer’s Almanac even has a recipe called Cure-All Chicken Soup. My papà had an ulcer and in those days science hadn’t discovered that a virus was what caused it. Whenever his ulcer acted up, mamma would make stracciatella or pappa in brodo. 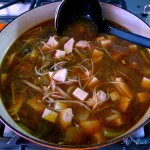 The recipe for pappa in brodo was homemade bread cubes in homemade chicken broth. And magically, whether it was a cold, flu or upset stomach, the eggy broth made us feel better. This picture was taken soon after they were married. They were a perfect match!! March the 8th is the International Day of Women and I can’t let the day pass without honoring her strength, her love, her passion for her family. She was wonderful and how she accomplished what she did never cease to amaze me. Whenever I’m in the kitchen I think of all the happy hours I spent there with her and my papà. Mamma and I would be cooking and my papà would be sitting at the kitchen table reading his Italo-Americano — a newspaper published in the States written in Italian. He’d read it from the first page to the last. Every. Single. Word. Make this “your way” and to your taste. 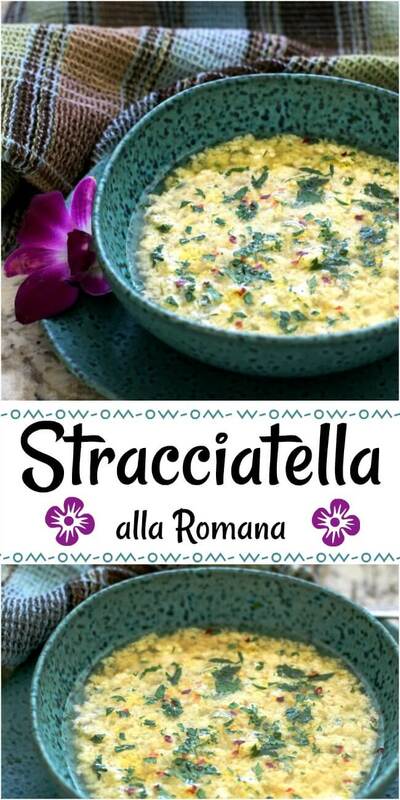 I promise you’ll love this stracciatella recipe!! The following are affiliate links. we are a participant in the Amazon Services LLC Associates Program, an affiliate advertising program designed to provides a means for us to earn fees by linking to Amazon.com and affiliate sites. 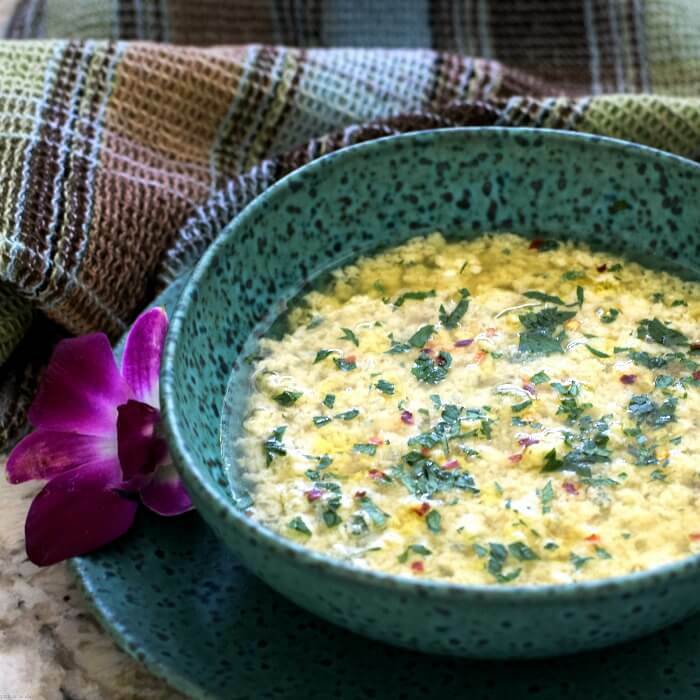 This lovely light egg drop soup is named after the egg mixture that forms little curds that look like torn rags – stracetti. It is the perfect soup when you’re too tired to cook or when you don’t want a hearty meal. The ingredients are inexpensive and ones you usually have on hand. 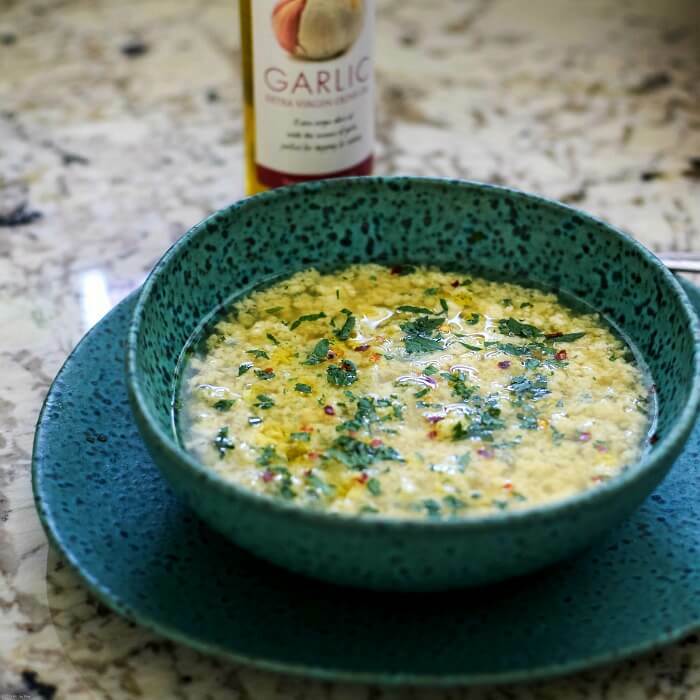 The taste of stracciatella soup is anything but bland or unimpressive! Try it and you’ll love it as much as we do. Note: Recipes and content from © 2014 – 2018 All Our Way are copyright protected. Please do not use content or recipe without prior written permission. If you want to share the information, please link to this post. Grazie!! You’re right, Susie! Honey talks about drop noodles all the time. I think he wants to try to duplicate it. Thank you for commenting. Love and hugs to all. Hi Marisa- this IS one of our favorite soups as well, though we typically add a whole lot more of spinach. I do like your recipe.. Quick, easy, and delicious. I’ve never thickened my eggs with anything, so I am intrigued by your method of adding ‘semolina’ to the eggs, which gives more substance to the threads. By ‘semolina’, you mean the coarse/gritty Cream of Wheat , or the fine, golden semolina flour that I buy from King Arthur to make my breads? Hi, Dolores! I mean the fine, golden semolina flour that you get from KA or Bob’s Red Mill (I think that’s the name) The Cream of Wheat is what I use in my Gnocchi in brodo. It’s so cold here today I’m craving a nice hot bowl now!! Have a wonderful day. By far my favorite soup! Thanks for the perfect recipe! Egg drop soup…. Oh man I haven’t eat that like for AGES. I’m glad you reminded me of this delightful soup. I love your version and I can’t wait to try it. I love egg drop soup. It’s so simple but brings such great flavor and I love that you can mix the additions up depending on what you have in the house. Yum! What a flavorful Italian recipe! 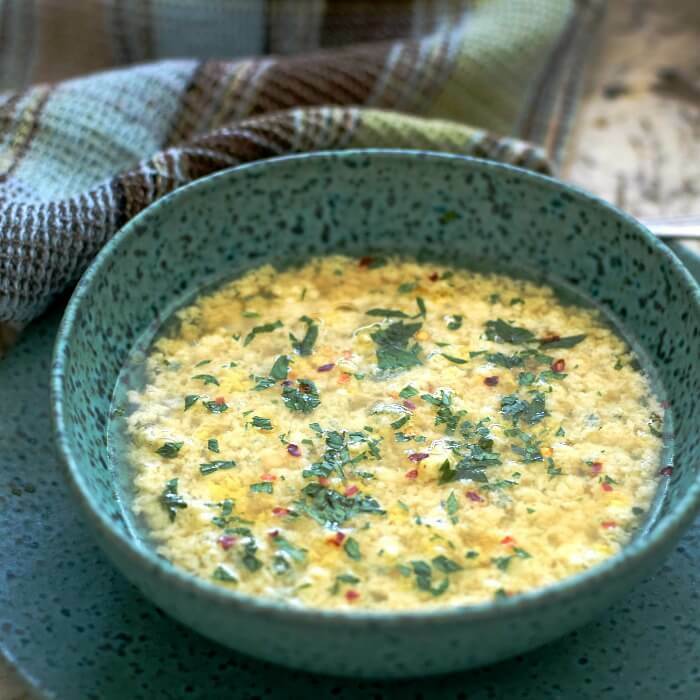 I love Chinese egg drop soup, so this wonderful recipe is perfect for me. Extremely easy list of ingredients. That’s what I love. This sounds fantastic! Looks tasty! This recipe is perfect for me and my family. Thank you! My family loves this soup! Very interesting combination of ingredients. I really like. THANK YOU! I’ve heard of this soup before and feel like I must have had it at some point in my life, as I grew up in an Italian household. I’ll have to try this because I honestly can’t remember but it sounds really good! wow does this ever bring back memories of my childhood. 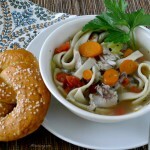 Mom always made this soup for me when I was a little under the weather. I can just smell it cooking reading your recipes and brought a fond tear to my eye. Amazing how your Region learned the same ways we did. This is perfect! Wonderful recipe, and a great little glimpse into your family’s history. As you point out, it’s so interesting that variations on an egg-drop-soup can be found all around the world. It guess it’s a versatile way to cook without too many ingredients! Love this version – it sounds both hearty and light all at once. Perfect for what ails you – or any reason at all! Pretty much every “poor man’s food” I’ve encountered has been oh-so-delicious and comforting. Which in my mind just solidifies the fact that simple really is better! A soup full of pantry staples is my jam, and this one sounds mad flavorful. This looks lovely! I’ve never heard of or used semolina before so I’m looking forward to getting a bag and trying it out! I looooove soup but it can get too heavy in the winter. This looks like a lovely light soup for the summer. I love egg drop soup from the Chinese takeout. I can’t believe I’ve never had this Italian version! Your recipe sounds so good and I love the photo of your mom and dad! Hi, Pam!! It is a family favorite — and it is easy to make. I love that photo too. What a great story about your parents. Sorry your Dad suffered from ulcers, if only they knew then what they know now. The soup looks so comforting. I’m going to print it out for a sick day recipe since the ingredients are readily available and it looks easy to make. Thanks for sharing this and your family’s story. What a beautiful family story — it’s these precious moments spent doing ordinary things, but sharing them with the people that matter to you that make life special. It also seems that those ordinary but memorable times always happen in the kitchen… This soup sounds like the perfect soothing salve for whatever might ail you — whether physical or emotional wounds — beautifully written. I’m anxious to try this! I love a Chinese egg drop soup and something tells me that I’m going to like this recipe much more! Thank you for sharing with us at the #BloggingGrandmothersLinkParty! This sounds so good and is pretty low carb which makes me happy. Hello, Victoria! It is low in carbs and so satisfying. Hi, Karyl! Yes! There is an Italian version and this is it. It’s delicious! Hi, Marci! Lucky you!! Fresh eggs to make a delicious soup. I bet the eggs have that good old-fashioned taste we used to get. YUM!! My mom made a chicken egg drop soup and it was my favorite as a kid. Now looking at this makes me wanna make this soon. Love all recipes that come down the generation.. always so comforting Love this Marisa. Lovely post. Thank you, Veena! Whenever I start feeling unwell I think of this soup. Perks me right up. This is hands down one of my favorite soups. I haven’t made it in way too long and need to. I’ve never tried it with semolina for the egg – interesting add! 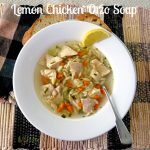 I had this soup at one point in my life and LOVED it! However I forgot about it. I like that it’s simple but so flavorful and that it’s so easy to make. I’m going to make this for lunch today. I don’t have any semolina, could I substitute something else or leave it out? I have some good homemade chicken broth to use too. Yum! I love your version of stracciatella, something my mother used to make also. It is a cure for what ails you. But I especially loved seeing your beautiful mamma and papà. Beautiful photo, recipe and memories. I think all of our mammas made this soup. It always made me feel better! Have a great weekend, Linda. Thank you, Linda! My parents certainly were special and when I think of them it really lifts my spirits. Ti auguro una Buona Pasqua. Un abbraccio forte. My mom made a version of this delicious soup. The noodles were more like dumplings…but we still called it drop egg noodle soup. Again…the simple recipes are sometimes the most delicious….and the perfect comfort food. Nothing beats a great homemade soup any day of the week. I agree with you, Gloria! I still crave this soup when I’m not feeling up to par. Have a great weekend. Hi, Gloria! I agree nothing beats homemade soup especially the ones made by moms and grandmothers. I think it’s all the love they put into the soup. I love the story behind this Marisa 🙂 Reminds me of the cure-all soup my grandma and my mom make. I love how everyone has their own magical soup recipe! And I cannot wait to try this. We had “warmer” weather last week but snow today so we definitely need this to ward of the sniffles as a result of the weird weather. Plus it just looks so delicious! Hi, Jolina! I sure hope we start getting some decent weather soon. I think I’ll make some more stracciatella just in case it’s still chilly. Hi, Jolina! Thank you! Frankly, I think every cuisine has their magical cure-all soup. Grazie, Chiara!! They are so special — they’re the reason I started the blog. I wanted to remember them and it made me feel as if they were closer. Un abbraccio forte! I love all of the optional add ins! Delicious and satisfying! Thank you, Lane. You can make it as filling as you want but we like it simple! Love, love, love the photo of your parents! They are so beautiful/handsome and sooo Italian! 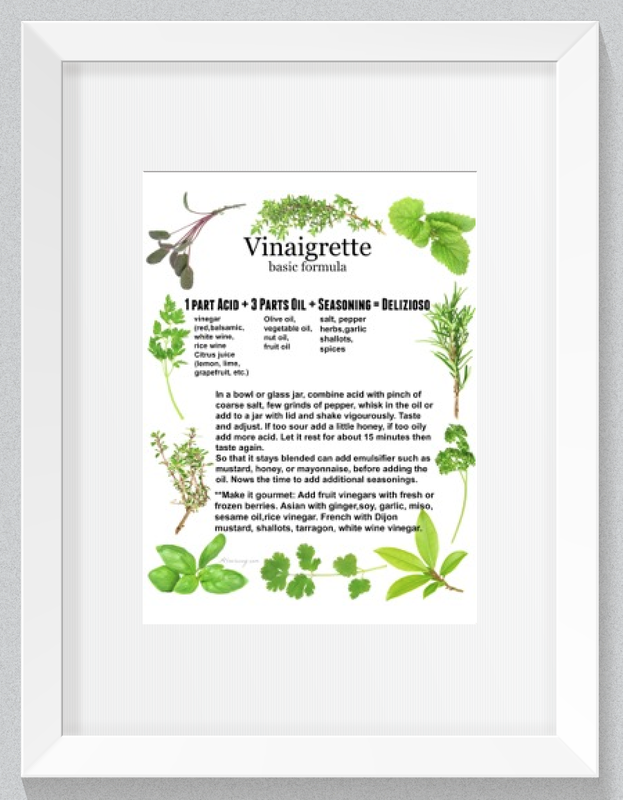 Just printed out the recipe and will make it soon…and if I remember and it looks as pretty as yours, I’ll send a photo. 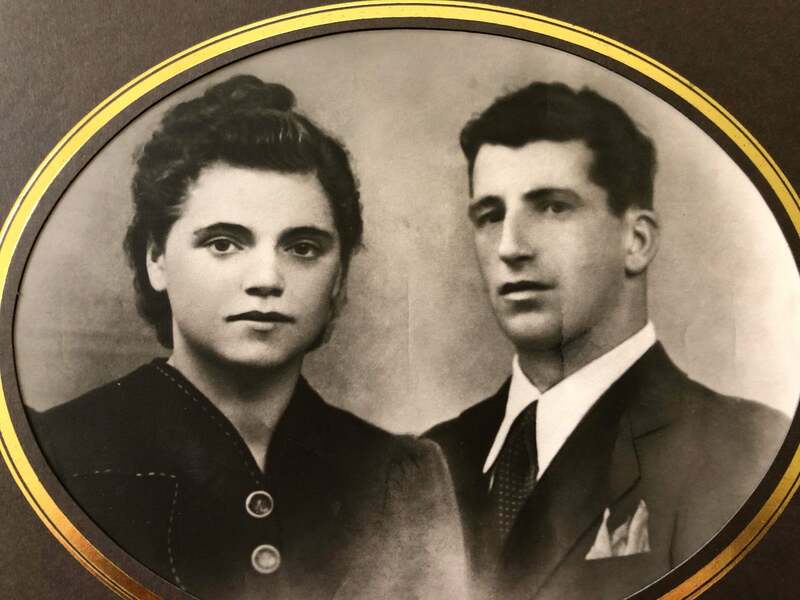 This is beautifully written – it’s a real tribute to your Mamma and Papà. The soup is lovely too – so simple yet delicious. One of my favorite soups. Light and delicious. Perfect for spring. Sometimes the easiest soups are the best, especially when you’re hungry. Have a wonderful day, Jovina!! Thank you!! I appreciate it. Posting the recipe today.